I have three endorsements for Tuesday’s Democratic runoff election. First, runoff elections are notorious for their lack of voter participation. It’s vitally important for Democrats to get out the vote in this particular runoff election if only to show they are still viable as a political force in conservative, Republican-dominated Oklahoma. It should only take a few minutes to vote given the paucity of races. The voter lines shouldn’t be that long even with a robust turnout since the ballot will be short. The clear choice in the Oklahoma House Representative District 88 race is retired police officer and accomplished writer Paula Sophia, pictured above. The winner in this race will win the overall election because no Republican or Independent filed for the seat. This is important to realize. HD 88 voters are deciding the race tomorrow, not in the general election against a Republican. Sophia faces Jason Dunnington, a former pastor and a candidate who extols his right-wing religious past as a reason you should vote for him. Don’t we have enough right-wing religious folks at the state Capitol? People I know who have met Dunnington on the campaign trail claim he comes off as charming and impressive, but his past just doesn’t fit with the liberal spirit and funkiness of HD 88, which includes the Paseo and Plaza districts. Dunnington is the candidate that most Republicans, undoubtedly, want to win tomorrow. Remember: The race will be decided tomorrow. Let’s be clear. A vote for Dunnington tomorrow is a vote sanctioning right-wing religious and conservative ideology. A vote for Sophia is a vote for progressive values, such as embracing diversity and equality. This is what Sophia . . . will bring to the job: Intelligence, vast historical knowledge of Oklahoma City because of her award-winning police work in a 22-year career and the ability to serve the varied interests of her constituents in a district considered one of the most liberal in the state. As a prose writer and poet, often seen wearing a signature beret, she will also bring style and difference to a staid legislature now dominated by ultra conservatives intent on denying people equal rights and underfunding education at all levels. As someone who struggled with gender conflict as she eventually transitioned from a man to a woman, Sophia will bring empathy and understanding to those constituents in need of help for a variety of reasons or those constituents who don’t feel part of the conservative Oklahoma status quo or who define or want to define themselves outside of the rigid, cultural codes of heteronormativity. Again, here’s my full endorsement. HD 88 voters also have a chance to make history if they elect Sophia. 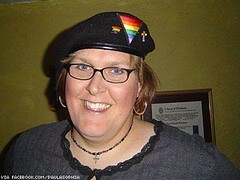 She would become the first openly transgendered candidate to win office in a state legislature in the nation. That would send a huge message to the world that there are, indeed, Oklahomans who embrace diversity and equality. Someone in HD 88 casually mentioned to me a couple of weeks ago that they were afraid Sophia could get beat by a Republican in the general election. Let me repeat: The vote tomorrow determines the winner of the seat because no Republicans filed to run for the position. My next endorsement is for state Sen. Connie Johnson, pictured right, who faces what everyone in the media here calls a “perennial candidate” in the race to replace the retiring U.S. Sen. Tom Coburn. That perennial candidate is 79 years old and apparently makes it a hobby to run for various state offices to make some point that’s difficult to discern. He also apparently does very little actual campaigning. Johnson received the most votes in the primary election, but she didn’t garner enough votes to get beyond the 50 percent threshold needed to prevent a runoff.
. . . Johnson, on the other hand, is an accomplished state senator with bona fide progressive credentials. She’s running a credible and viable campaign with volunteers and donors. She may face an uphill battle against the better-funded Lankford in the general election, but this runoff election is simply a waste of Democrats’ time and money. They need to come out in big numbers Aug. 26 to support Johnson, and that means party workers at all levels throughout the state need to work to get out the vote for her. I do expect Johnson to win this election and face U.S. Rep. Lankford in the general election for Coburn’s seat, but a big turnout for Johnson could energize Democrats here. Johnson is well known in the Oklahoma City area as an advocate for corrections reform, reproductive rights for women and wider medical access. While some Democrats have either lost their voice during the recent conservative wave in Oklahoma or given up the political scene entirely, Johnson has been an unwavering fighter for economic equality and the rights of women and minorities. In the end, it’s simply a no-brainer. Johnson has the political and work experience that makes her by far the best Democratic candidate in this race. There’s simply no question about it. Again, here’s my full endorsement. I also support Freda Deskin for state Schools Superintendent in the Democratic runoff against John Cox. Deskin has received the endorsement of Victor Hutchison, a founding member of Oklahomans for Excellence in Science Education (OESE) and an emeritus zoology professor at the University of Oklahoma. The Tulsa World has also endorsed Deskin. Deskin is clearly the best candidate, with a long and wide-ranging experience in education at all levels. At the meeting in Norman Cox’s answer to a question about teaching evolution, his first response was “I believe in God.” In follow up statements he made it clear that evolution in public schools was not one of his concerns; he did this by quickly changing to other topics. He was not well-received by that audience and many there thought he was the worst of the four candidates who appeared on different dates. Deskin understands public schools, and we believe she would be the kind of collegial leader that Oklahoma education needs to follow Barresi. Her platform is not ideal, but it is closer to the reform agenda the state needs than her opponent. I especially think voters should note Hutchison’s concerns. tative seat in Oklahoma’s 5th Congressional district runoff election on the Democratic side? It’s just too close to call for me. I have known and talked to both candidates through the years. Guild was a colleague of mine at the University of Central Oklahoma where we worked together on the UCO and state affiliates of the American Association of University Professors. McAffrey made history by becoming the first openly gay Oklahoma legislator, an event that is extremely important in the march to equality here. Each candidate would be a solid representative on the Democratic side in the race, which pundits have argued is a sure victory for Republicans in the general election.